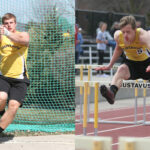 The Gustavus men’s track & field team competed at the Mustang Open at Mount Mercy University on Saturday as a full team for the first time this outdoor season. Andrew Stumbo, Taylor Rooney, Alex Wischnack, and Michael Hensch all led the Gusties with first place finishes in their respective events. 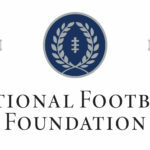 The National Football Foundation & College Hall of Fame (NFF) Wednesday announced the members of the 2019 NFF Hampshire Honor Society. Gustie seniors earning a place on this year’s team include Jamison Beulke (Montgomery, Minn.), Michael Hensch (North Branch, Minn.), Sean Kelly (Shorewood, Minn.), Jack Sorenson (West St. Paul, Minn.), and Tanner Sparrow (Edina, Minn.). 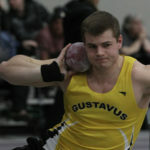 Gustavus throwing specialist Michael Hensch (Sr., North Branch, Minn.) took 11th in the shot put Saturday at the NCAA Division III Men's Indoor Track & Field Championships. 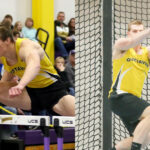 Michael Hensch (Sr., North Branch, Minn.) and Taylor Rooney (So., Andover, Minn.) represented Gustavus at the NCAA Division III Men’s Indoor Track & Field Championships on Friday. 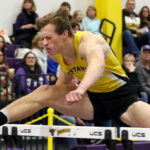 The 2019 NCAA Division III Men's Indoor Track and Field participants were announced on Sunday and Gustavus will be represented by Taylor Rooney (So., Andover, Minn.) and Michael Hensch (Sr., North Branch, Minn.). 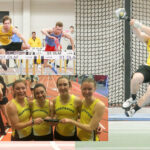 Rooney will compete in the 60-meter hurdles with a seed time of 8.14 (10th), while Hensch will compete in the shot put with a seed distance of 16.39 meters (15th) and the weight throw with a distance of 18.47 meters (16th). 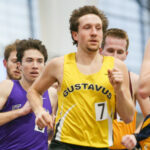 The Gustavus men’s track & field team took fifth place at the MIAC Indoor Championships on Saturday at St. Olaf with 68 points. St. Thomas claimed the title with 185 points. 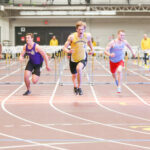 The Gustavus men’s track & field team sits in a tie for fourth place after day one of the MIAC Indoor Championships with 46 points. St. Thomas leads the field with 103 points. 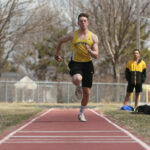 The Gustavus men’s track & field team won the Maverick Invite on Friday, hosted by Minnesota State University, Mankato. The Gusties scored 151 points.